Over his long and distinguished career, Sonny Rollins has made many dozens of albums. 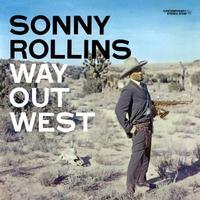 Among those recorded during the 50's, Prestige's Movin's Out and Saxophone Colossus, Blue Note's A Night at the Village Vanguard, Riverside's The Sound of Sonny, and Way Out West on Contemporary qualify as all-time Rollins classics. The session for Way Out West, Rollins' first ever in California, was called for 3 a.m. to accommodate everyone's busy schedules. Sonny, who could never be accused of overstatement, announced after four hours of recording: "I'm Hot Now". The sax just leaps out of the speaker. The music speaks for itself, I needn't review that here. What a great pressing.